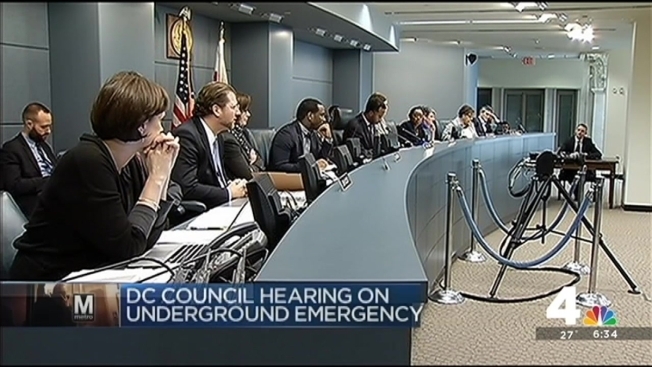 Communication problems are still a major concern, and D.C. Fire and EMS crews rank last when it comes to training inside the Metro system, officials revealed Thursday at a D.C. Council hearing on how prepared the city is for emergencies on the subway system in the wake of a fatal accident last month. "You asked me should you be concerned in going down in the tunnel and using a radio, I'm going to tell you this: You'd do better using your cellphone," said Kenneth Lyons, president of AFGE Local 3721, which represents D.C. EMS workers. Ed Smith, the head of Firefighters Association Local 36, which represents D.C. firefighters, expanded on that concern. "We have radio problems throughout the city, not just in the Metro system,” he said. “We've always had problems with these large buildings downtown." Those comments did not sit well with D.C. Council member Kenyon McDuffie, chair of the Committee on the Judiciary, who called the meeting. A copy of the number of first-responders who have gone through Metrorail emergency response training programs, by year, by agency, showed last year D.C. Fire and EMS ranked last with just 100 going through that training. In Fairfax County, 745 took the training, 435 took part in Montgomery County, 250 in Arlington County and 146 in Prince George’s County. But interim Metro General Manager Jack Requa said he believes Metro is safe, and McDuffie said he rides Metro and encourages others to ride Metro. The National Transportation Safety Board is investigating the cause of an electrical malfunction that caused a train to fill with smoke in a tunnel near a downtown Washington station. One passenger was killed and more than 80 others were taken to hospitals with smoke inhalation.